The HS35 from Fieldpiece is the next option to the cheaper HS33. 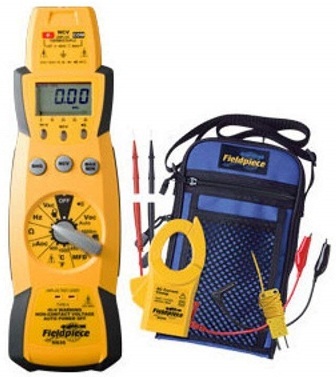 It is a fully operational HVAC stick multimeter with auto ranging, DC micro-amps scale and bar graph display. Main differences with the HS33 are the addition of auto ranging, wider test ranges and better resolution. It lacks a backlit display but does have expandability through detachable heads. The HS30 line of stick multimeters from Fieldpiece was built for the HVAC engineer. You can perform all HVAC tests with the HS35, such as temperature compensation and flame sensor checks. It is more useful than the previous HS33; auto ranging being a lot easier to work with for one – plus it has manual ranging – and its wider test ranges make a big difference. The addition of micro-amps lets users test flame diodes and there is a larger scale on temperature – up to 1000°F. The big omission is the lack of a display backlight (which the HS36 has). Sensitivity on millivolts can be an issue and there is no ghost voltage-eliminating low impedance option. As with others in the HS30 series, it comes with an included amp clamp. This clips right onto the top and can measure up to 400A. There’s a large range of other heads available from Fieldpiece besides this, such as a combustion checker and dual temperature heads. It is the same build as the others, with tough ABS case, rubberized corners and a handy built-in magnetic hanger. The ergonomic, thin and long design allows it to fit into your hand more easily than a standard multimeter. Display: An upgrade over the HS33, with 3¾ digit (3999) count. You also get an analog bar graph – great for picking up faster changing signals. There is no backlight. The Fieldpiece HS35 comes with various other functions, to include a Max/Min mode. This lets you see the high and low values of a given test. There is also a screen hold, AC voltage detector, a voltage indicator and auto power-off. Input protection suggests to CAT-III, which is to 6kV. An in-built PTC increases safety when testing higher energies. The Fieldpiece HS35 is a decent device for those into HVAC works, with okay features and accuracy. It is worth paying a bit more than the HS33 as you get better test ranges, micro-amps and auto ranging.